Anne Crandall (Irene Dunne) is a widowed smalltown mayor who lives with her father-in-law (Charles Coburn) and high-strung teenage stepdaughter Diana (Mona Freeman). Anne lives a very circumscribed life, always conscious of the townspeople's watchful eyes, as well as how her choices will affect the dramatically inclined Diana. When a lightning bolt knocks the head off the town statue of Anne's late husband, she journeys to New York to interview sculptor George Corday (Charles Boyer) about creating a new statue. Sparks fly between Anne and George, but the wary Anne tries to call off the project and flees back home to her dull life. George, however, won't take no for an answer and soon he and Anne are TOGETHER AGAIN. The title of this delightful film was doubtless meant to remind audiences that the film reunited the stars of the 1939 classic LOVE AFFAIR. Dunne and Boyer are a wonderful team. TOGETHER AGAIN may not be in the topmost tier of comedy classics, but it's a very good, well-made film with some laugh-out-loud funny moments near the conclusion. It's a thoroughly entertaining movie. As far as I'm concerned, Irene Dunne can do no wrong. She was a true original, adept at comedy, drama, or musicals. I especially love her speaking voice; like Jean Arthur, Dunne had a voice which can make me smile just hearing it. She was also unique in that she was a bit older than the typical leading lady of that era; she was 46 the year TOGETHER AGAIN was released. Although she was nominated as Best Actress on five occasions and starred in numerous classics, today she inexplicably isn't as well remembered as many other stars. Charles Boyer is simply charming in this film. 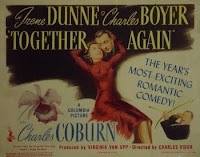 I enjoy him most in light comedies such as TOGETHER AGAIN and CLUNY BROWN (1946), or in the unusual comedy-drama HISTORY IS MADE AT NIGHT (1937). One has the sense when watching this film that both Boyer and his character are having a very good time. The soundtrack not too subtly reminds audiences of Coburn's Oscar-winning role in 1943's THE MORE THE MERRIER by playing his theme song from that movie as background music in one of his scenes. The same musical gimmick was used in another of Coburn's 1944 films, THE IMPATIENT YEARS. Mona Freeman made her film debut the year this was released; TOGETHER AGAIN was one of four films she appeared in in 1944. Her best-known role as a teen actress was probably in MOTHER WORE TIGHTS (1947), in which she and Connie Marshall played the daughters of Betty Grable and Dan Dailey. She also appeared in DEAR RUTH (1947), THE HEIRESS (1949), COPPER CANYON (1950), and ANGEL FACE (1952). Starting in the mid-'50s she worked mainly in television, including playing the memorable character Modesty Blaine in two episodes of MAVERICK with James Garner. After the mid-'60s she only acted in one more TV production before retiring. This year she turned 83. The supporting cast includes Adele Jergens, Elizabeth Patterson, Janis Carter, Hobart Cavanaugh, Charles Dingle, Carl "Alfalfa" Switzer, and Nina Mae McKinney. Jergens and McKinney are particularly noticeable in their brief roles as a model and a ladies' room maid. IMDb says Shelley Winters has a bit part; I'll have to watch for her next time. TOGETHER AGAIN was directed by Charles Vidor. It runs 100 minutes and was photographed in black and white by Joseph Walker, who shot many classic films including Frank Capra's best-known titles. Irene Dunne's gowns were designed by Jean Louis. 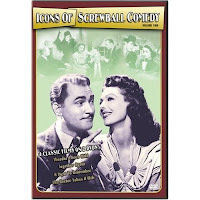 TOGETHER AGAIN is available on DVD in the ICONS OF SCREWBALL COMEDY VOL. 2 set. The three other movies in the set are Dunne's THEODORA GOES WILD (1935), which I haven't seen since an L.A. revival theater screening in the '70s, and two enjoyable Loretta Young films, A NIGHT TO REMEMBER (1943) and THE DOCTOR TAKES A WIFE (1940). The set has been reviewed by Dave Kehr at the New York Times and by Paul Mavis at DVD Talk. It's an excellent value, with four fun movies which provide solid entertainment.